10. 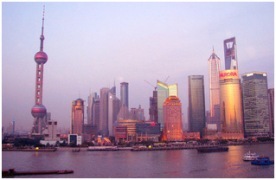 EPS: China: overheating economy? So, is the Chinese economy overheating or not? It depends who you ask. The Chinese themselves would be the first to realize that the economy is overheating and they would have two important levers at their disposal to cool the economy down which they have so far not used. They could either revalue their currency (to the delight of the US) or raise interest rates both of which would have a tightening effect. They are biding their time on both fronts at present, so the Chinese do not feel that the situation is out of control as some are suggesting. Despite the changes, the Chinese are sticking to their forecast of 8% growth for 2010 despite already overshooting it on a quarterly basis. They are still cautious about the global economy, perhaps expecting so ugly surprises later in the year from a still leaky US economy and the at times terrifying news from the European economy. The Chinese government is clearly worried about the possibility of a real estate bubble as it has recently implemented a property tax trial in four major cities in an attempt to cool the market. Beijing, Chongqing, and Shenzhen and Shanghai at a later date. The new legislation has already hit property related stocks and many analysts feel that it is inevitable that the property market will be hit hard in the "anti-bubble" drive. There are also moves being taken against developers who are artificially managing supply and demand in the market. The central bank has also raised mortgage rates, increased the level of down payments for home loans and obliged banks to restrict loans for buyers of three or more homes. Clearly the level of reaction being taken reveals the level of worry. Real estate is the sector to watch. Published by agreement with The Global Dispatches. Expert Commentary and Analisys.